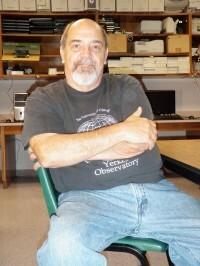 Tom Morin has been an adjunct professor at Plymouth State for over 10 years. He is involved in developing curriculum for NASA Projects: WISE, and Kepler, and Hands On Universe. Tom serves as a consultant for various testing centers relating to student assessment for Education departments in New England, Ohio, and Utah. He also trains students for the International Asteroid Search in which data collected is used by the Minor Planet Center to monitor Near Earth Objects (Asteroids).